Telcel owned by Mexican billionaire Carlos Slim to get competition from new $10 billion open network. The new network would be run as an independent “carrier of carriers,” and would be available to any interested mobile-service provider at regulated and non-discriminatory costs. According to the government, this will translate in lower mobile-service prices for consumers, and encourage providers to enter the market offering phone, Internet and data services on mobile devices. The project is a key part of President Peña’s campaign to boost competition in Mexico’s wireless market, where América Móvil SAB unit Telcel holds a 70% share. As there are some complex regulations involved, some industry analysts remain skeptical of his plan, which according to them is the first of its kind. The network could potentially be used by hundreds of mobile-service providers, but its operator would be barred from providing service directly to consumers to avoid any conflict of interest. The process is to tender a high-quality slot of radio waves that would be exclusively used by the new mobile network. The new open network will benefit operators that don’t have their own network but want to provide mobile services, according to experts. But it could also be used by current operators that own their networks to gain more spectrums and offer a better service to their clients. The program is expected to kick off in December. The government plans to take bids to build the network in February, with the winner to be announced by August, and it is planning for the new network to be deployed by the end of the current administration in 2018. According to industry insiders, Nokia, Alcatel-Lucent SA, Huawei Technologies Co. and Motorola Mobility have shown interest in providing equipment and have participated in field tests to evaluate the project. The government also has to select an operator for the network, which analysts say could be a large global telecommunications company. The new infrastructure also opens options for Mexican media companies. Grupo Televisa , the country’s biggest TV broadcaster and pay television provider, is also looking for options for offer mobile service to its 9 million TV subscribers after selling its 50% stake in Iusacell. Mexico has suffered for decades from a highly concentrated telecommunications market, resulting in higher prices, saturated networks, and the lowest investment per capita. Mexico also has the lowest mobile broadband penetration rate in the OECD, with around 14 subscriptions per 100 inhabitants at the end of 2013, according to data compiled by the OECD. That’s below Chile, which had 36, and the average of 72 for the group. Market regulation could also be problematic. Regulated rates would be imposed in order to offer competitive costs for mobile providers interested in using the network, squeezing profit margins for the operator. Another concern is that the network could end up costing the government billions of pesos a year in subsidies. Since the operator will be forced to cover almost 100% of the country’s territory, even remote rural areas, it will be state-owned firm Telecomunicaciones de México that will provide the mobile service in areas where there is no interest from private firms. Whatever the future may hold, it will be for the good for the nation. MIPCOM and MIP TV organizer Reed Midem have announced the launch of MIP Cancun in November. Market is all set to draw leading Latin-American TV buyers. Coming this Nov. 19-21, acquisition execs from some 40 regional channels along with around 40 distributors of international programming, will come to JW Marriott in the resort town of Cancun, will focus on scripted and unscripted content, including fiction, formats, factual and kids entertainment. According to the event organizers, Spanish-speaking viewers are one of the fastest growing audiences of the entertainment industry and Mexico is the world’s leading producing nation of Spanish-language content. MIP Cancun meets a growing demand for international companies looking to do business with their counterparts in Latin America explained the organizers. Even Mexico was the MIPCOM’s country of honor earlier this month in Cannes, France. The retail sales in Mexico rose more than analysts expected in August. Accelerated job creation and a rebound in consumer confidence helped bolster spending. A jump of 4.4 percent sales rose from the earlier year, the fastest in five months. The statistic agency of Mexico reported this rise on their website. According to median estimate of expert analysts saw an increase of 2.7 percent. This was the second consecutive month in which sales growth has beaten economist forecasts by experts. Mexican economy is gaining steam which is relevant with the jump the sales. The growth had stumped even the expert economists’ forecasts in seven of the past nine quarters, according to PNC Financial Services Group and Goldman Sachs Group Inc. Recovering from the lowest level in almost four years in January after Mexico introduced new taxes on sugary drinks and junk food and raised the sales tax in some states, the consumer confidence rose to the highest in a year last month. In September only, the economy generated 156,400 payroll jobs, beating the 118,000 forecast by analysts surveyed by experts. The gain was more than twice as big as the August increase. The economy is regaining momentum as the gross domestic product expanded 1 percent in the second quarter from the previous three-month period, surpassing estimates of a 0.8 percent increase. The economy grew at an annualized rate of 4.2 percent in April through June. To further jazz up the consumption gains, the path is to create stronger job creation and faster credit growth, according to Ramos. Wage growth has been sluggish over the past year and “significant slack” remains in the jobs market, Ramos further added. Though all is not good, there is weakness too in some measures of consumer spending. Same-store sales tracked by a trade group called Antad, which represents supermarkets and department stores, fell 2.1 percent in September from last year, missing analysts’ estimate of a slight increase. Last month’s same-store sales at Wal-Mart de Mexico SAB, the nation’s largest retailer, slid 2.7 percent and shares hit a six-month low Oct. 20 after its third-quarter profit missed analyst estimates. Olajide and Fazel have designed the program in such a way that the models get involved in the schedule. They will do about five hours of physical training per day, incorporating all the elements from their different classes like Aerobox, Aerojump, Aerosculpt, and Yoga. Plus the trainer duo has set up the women in a healthy meal plan that’s full of protein like fish and chicken and fresh, local fruits and vegetables. According to the article published with yahoo, Olajide has informed that he has based much of the itinerary on the technique he famously used to get Adriana Lima ready to walk the runway just eight weeks after she gave birth. The training is though primarily for the Victoria’s Secret casting, but as per Olajide, the end goal is much bigger than that. According to him, the workout is making the models feel so good, and they are getting this sense of accomplishment, doing things they didn’t know they could do. There’s a mission and a purpose. They’re living like fighters. And instead of a belt, their prize could be Angel wings, and household recognition. Olajide and his partner are also enjoying along with the gorgeous women in between sweat sessions to bring the best out of them in the tropical runway training camp at Tulum. Playa del Carmen’s La Quinta Avenida (Fifth Avenue) in the heart of the tourist destination south of Cancun, is all set to get the newbuild, 314-room Hyatt Playa del Carmen. Though an opening date has yet to be determined but the gates should be open sometime in mid-2015. Cancun is a city in south eastern Mexico, located on the northeast coast of the Yucatán Peninsula in the Mexican state of Quintana Roo. It is a major world-renowned tourist destination. The city is located on the Caribbean Sea, and is one of the easternmost points in Mexico. Cancún is located just north of Mexico’s Caribbean coast resort band known as the Riviera Maya. The island tourist zone is actually a part of the world’s second-longest coral reef and a perfect place to get the new kid on the block – Hyatt. The hotel spokesperson informed further that presently they don’t have a specific date to share but they are targeting for next spring. They are taking reservations for July 1 and going forward, but when a more specific spring date is available, they will open reservations for the earlier dates. The urban beach hotel property will not be an all-inclusive but will offer two restaurants and three bars/lounges located along the Paseo, a large, open-air corridor that will connect the entrance of the hotel to Playa Mamitas beach. Other facilities will include the Spa at Hyatt Playa del Carmen, a fitness centre, events space and a business centre. In Cancun, Hyatt currently has the all-inclusive Hyatt Zilara Cancun; the Hyatt Ziva Cancun is slated to open in December 2015. Mexican cuisine is famous around the globe. It has become a global sensation but its basic staples still remain to be the native foods such as corn, beans and chili peppers, beef, pork, chicken, goat and sheep and cheese and various herbs and lots of spices. Mexican cuisine is as complex as any of the great cuisines in the world, such as those of India, China, France, Italy and Turkey. Travel blogger Ryan Gargiulo of ‘Pause the Moment’ who had recently spent a year as an ex-pat in Playa del Carmen, in an interview shared his experience of the best spots to eat in this bohemian Mexican city on the Caribbean Sea. Situated on the edge of the turquoise blue waters of the Caribbean, Playa del Carmen is truly a destination that can’t be missed when traveling to the Riviera Maya. From street side vendors to the best in Mexican and international cuisines, everything is under cover. Playa has some absolute gems on offer. If you’re looking for an authentic Mexican restaurant in Playa del Carmen, look no further than La Coronela. They serve authentic and delicious Mexican food in town and it’s open for breakfast, lunch and dinner. “Some of my favorite dishes include the fajitas, burritos (chicken/steak/arrachera), the house salad with grilled chicken and the tortilla soup. Oh, and don’t forget to order a side of Guacamole. It’s to die for,” said Ryan Gargiulo. Oh Lala is another food stop that you should consider along with Bio Natural. It’s the place where you can look for healthy food in Playa like fresh salads, falafel, quinoa, cous cous, tofu, vegan lasagne, veggie pitas and a whole lot more. If healthy food is not your pick then what about mouth watering deep dish pizza? Look no further than Don Chendo. That’s right, folks, yummy pizza right at Mexico. You can also try a Jamaican jerk chicken joint, Ferron. Burritos, guacamole and tacos have become world famous. You can find the greatest burritos and tacos in Playa del Carmen at every small street food stall. Don’t forget to try the traditional Mexican dessert and hit up one of the many churro stands in town. 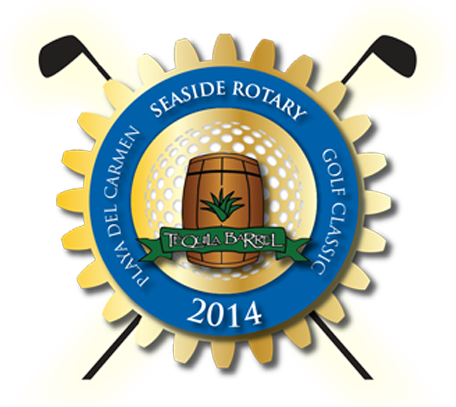 The 2nd annual Seaside Rotary Golf Classic Charity Golf Tournament will be held on November 1, 2014 at the Grand Coral Golf Club. The Rotary comprises of a group of Mexican and expatriate professionals who have come together and organized the new Playa del Carmen Rotary Club. The club is all eager to serve their community and give the meaning of companionship and fellowship a new edge. According to the members, their core mission is to help improve the lives and prospects of Playa’s needy children. Originally a small fishing town, Playa del Carmen is located along the Caribbean Sea in the state of Quintana Roo in Mexico. It is no doubt that the Riviera Maya is the landscape for some of the most beautiful golf courses in the world which coincidentally attracts many golf excited vacationers every year and some the most prestigious golf courses include Grand Coral and Maya Koba! But if you are still not planning a trip down to the Rivera Maya to conquer those 18 holes, you might want to consider again. Love for your game and for vacation all in one. Shower a little extra love to your beloved game by entering a charity golf tournament. How often do we have the opportunity to do what we love and support an amazing cause at the same time? The Grand Coral Golf Course that will be the hosting course for this game with a noble cause is a treat in itself. The golf course set amidst beautiful nature adds another perk along with the raised money. It will be a full day of golf including great food and prizes! El Taj, Plank Restaurant, Imprevist and the GYM are the proud sponsors of this incredible event. All proceeds for the 2nd annual Seaside Rotary Golf Classic Charity Golf Tournament will be divided up to numerous charitable causes such as KKIS (Keeping Kids in School), Cruz Roja (Red Cross), DIF Solidaridad, Christmas Dreams and Kick4Kids. All of these are local charities that truly work hard to help out the community and are super geared towards extra smiles and better lives for children. Hope to see you all golfing away and spread a smile across all those amazing kids of Playa del Carmen. Located 42 miles south of Cancun, Playa del Carmen is one of the most popular vacation destinations in Mexico. With an abundance of natural beauty, interesting water sports, a fabulous art scene, nearby Mayan ruins, fantastic restaurants and a rollicking nightlife, it’s easy to see why. Playa del Carmen has been attracting tourists from around the world, varying from honeymooning couples to families but now it seems that the popularity of this breathtakingly beautiful beachfront village is soaring so high it has even got the aliens intrigued! So much so that they even came visiting! On May 29, just after sunset, an unusual dark alien object was noticed in the sky over Playa del Carmen in Quintana Roo, Mexico. As the sun was setting, the witness almost lost visual contact with the object. He rushed home to fetch his Yukon pro 5×45 night vision monocular and Angel Eye digital video recorder and managed to record approximately five minutes of video of the black UFO before the batteries died. He then uploaded slightly a 2-minute clipping of this video to YouTube, showing the strange object moving across the dark sky. The witness describes the UFO as being “black, no lights and silent” and states that it did not fit into anything that he could explain or identify. Throughout history, most UFO sightings have been difficult to prove and easily dismissed as hoaxes or simple misunderstandings. About this one, we will just have to wait and watch. Puerto Morelos, Quintana Roo is a nature’s paradise. But over the years it has endured the ravages of commercialization development and tourism. Due to this the natural flora and fauna of the water surrounding it has been severely impacted. 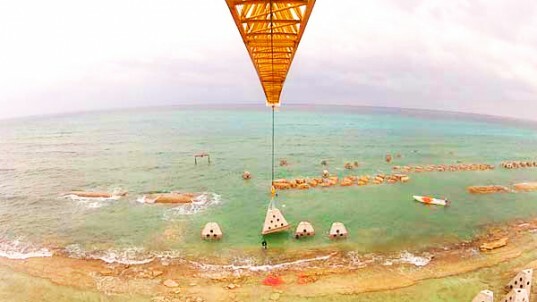 In an effort to protect the ecology the construction of the world’s longest artificial reef is underway. The project named The Kan-Kanán aims to be about 1.9 Km long once completed. The reef will protect the fragile ecosystem off the coast and replenish the natural aquatic habitat of the region which is facing grave danger. According to the experts working on the project the reef will support more than 13,000 species of marine life. The reef will be longer than the Brooklyn Bridge. The Kan-Kanán project is being constructed near Puerto Morelos. Puerto Morelos already has the second longest barrier reef in the world. Since the shape of the new artificial reef will be like that of serpent along the coast, hence the name Kan-Kanán, which is the Guarding Serpent in Mayan Mythology. More than 100 environmentalists, divers, architects and engineers are involved in this ambitious project. The reef will have more than 1,000 hollow concrete pyramids, each weighing 10 tons, which will be placed on a base of concrete and microsilica. The perforated design of the pyramid like structure will house marine wildlife. The reef will also act as a barrier from the water and prevent erosion of the beach. Justin Bieber is always in the news and barely for the right reasons! Recently, an old video of his surfaced which shows the pop star telling a racist joke. In the clip, Bieber is asking – “Why are black people afraid of chain saws?” He then answers his own question with a hint to the N-word. Justin did apologize for his tasteless joke but to avoid all the heat that is blowing over due to his scandalous video he’s escaped to Mexico! The teen pop sensation was spotted yesterday in Playa Del Carmen, Mexico, easing it up with his crew and singer Rita Ora. With stunning white sand beaches, crystal blue Caribbean waters, a relaxed atmosphere and luxurious accommodations, Playa del Carmen, Mexico, has for long been a hit with the rich and the famous. Nestled in the Yucatan peninsula, the town is ideal for sun worshippers and party animals so it does not come as a surprise that many A-list Hollywood celebs have often been spotted vacationing here. 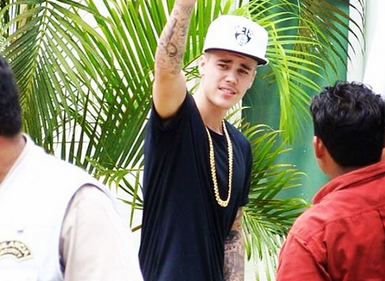 According to sources, Justin’s been put up in a lavish 5-bedroom villa in Playa del Carmen. The luxurious property also has a private squash court, gym equipment, sunken trampoline, outdoor hot tub, snorkeling gear, a private chef and a personal concierge. While the Girlfriend crooner is living it up in Playa del Carmen away from all the chaos created by his scandalous video, there are rumors doing the rounds that another one of his videos, involving racial slurs, is all set to be released. Now if that is true, we are going to be seeing a lot more of Justin Bieber in the news in the coming days!